Here you wil get the answer sheet of CBSE class 10 Science subject topper 2017. Students can view this answer script to get an idea about writing perfect answers in board exams and learn the way to present their answer sheet in the best way to grab more marks in class 10 Science board exam 2018. In this article you will get the answer sheet of CBSE Class 10 Science Topper 2017. You can download the this answer sheet in PDF format from the link given at the end of this article. 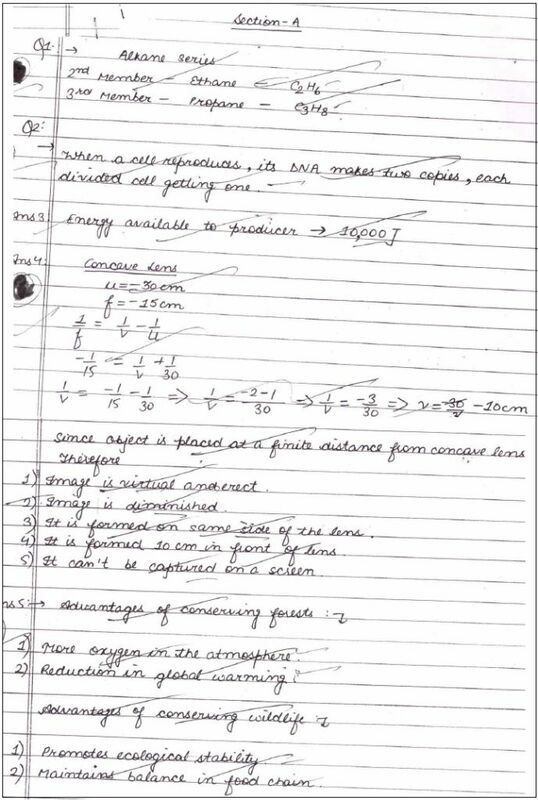 CBSE has published the CBSE class 10 Science exam 2017, topper’s answer sheet to present as a model answer sheet for the candidates who are going to appear for the CBSE class 10 board exams 2018. CBSE Class 10 Science Toppers’ Answer Sheet for year 2017 has been published by the board on its official site. Board has recommended the answers given in this sheet as the best possible answers to the questions asked in CBSE Class 10 Board Examination. The handwritten answer scripts of subject topper is avaiblae in the form of PDF. How to write the best answers for the questions carrying different weightage? How to present the answer script in board exam? Viewing the topper’s answer sheet as the real life experience, students can learn the technique to write perfect answers in board exams.